Psychologist and Nobel Laureate Daniel Kahneman discusses his new book - 'Thinking, Fast and Slow' - and why our gut instincts are usually wrong. Nobel prize winner and author of "Thinking, Fast and Slow" recounts his narrow escape from Hitler's SS, contemplates the illusion of skill and the psychology of investing in an interview with Steve Forbes. Biased Biases: Do Cognitivie Biases Give an Advantage to Hawks over Doves. 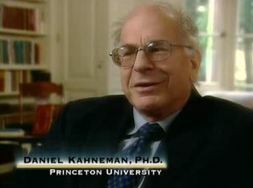 "PBS Airdate: October 19, 2009NBR's Dan Grech interviews Daniel Kahneman of Princeton University about prospect theory and other key ideas in behavioral finance.Stay tuned for further segments from NBRs Your Mind and Your Money series designed to help investors make better investment decisions."